Pile 2 pieces of tissue paper together and draw the outline of a circle. 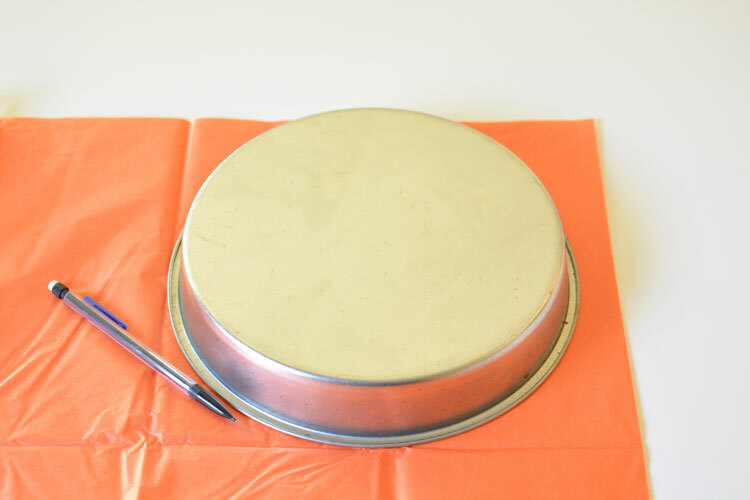 I used an upside down 9″ cake pan to draw the circles, but you could use anything round that’s around the same size. 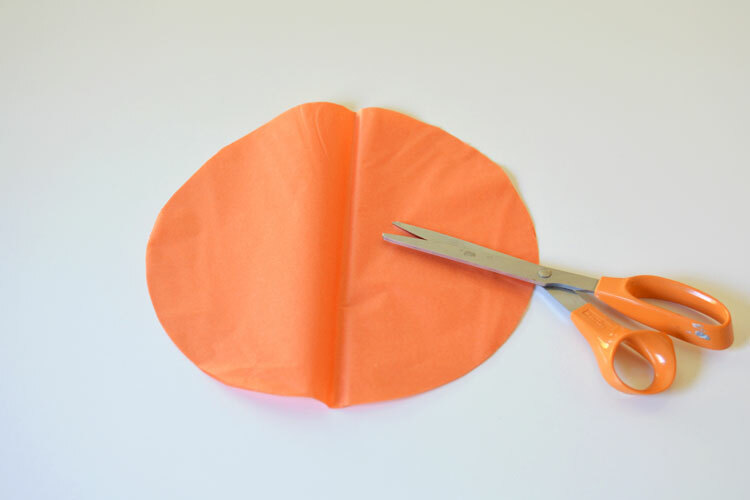 Using sharp scissors, cut out the circle. You need to end up with two tissue paper circles on top of each other. 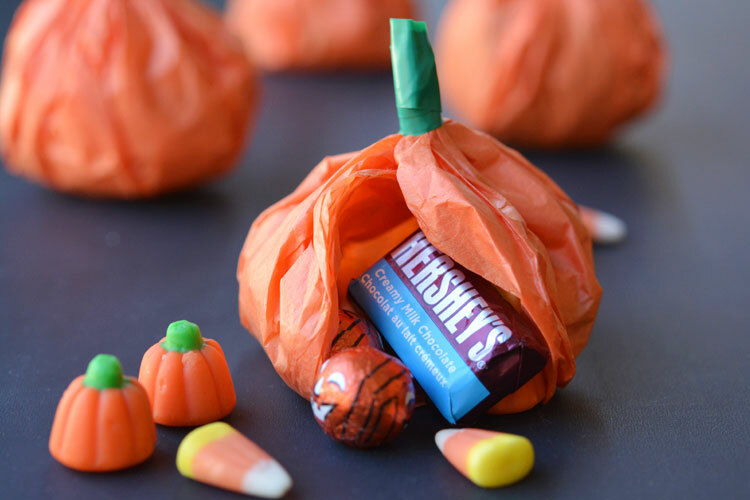 If you want to make more than one pumpkin, you could probably pile as many as 6 to 8 sheets of tissue paper together to speed things up. 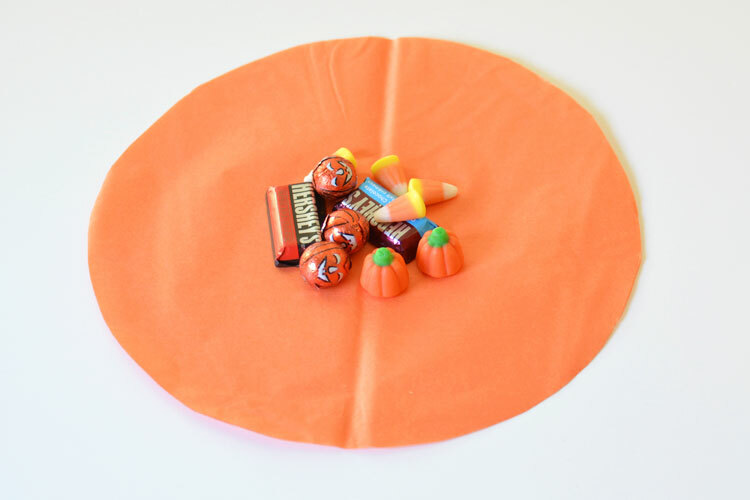 Pile your favourite candy into the center of the circle. You’ll have to do a little trial and error to see how much will fit. 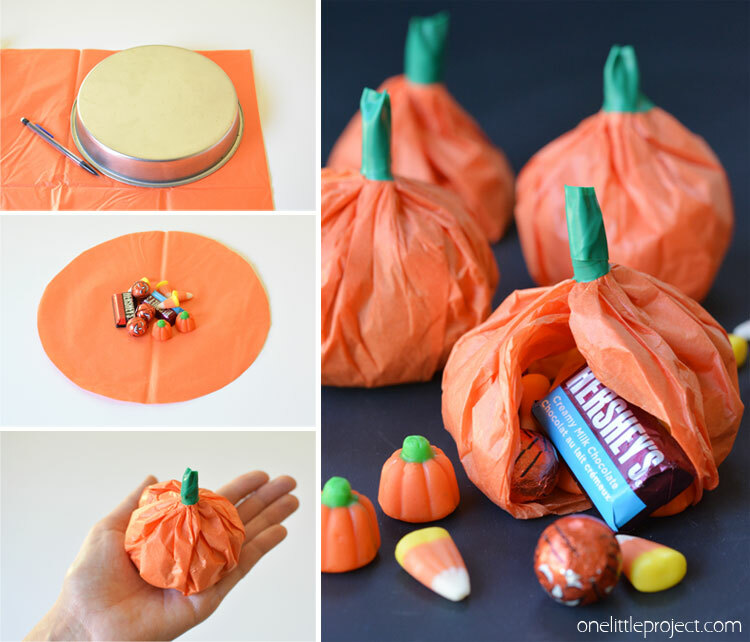 The more candy you add, the more round and “full” looking the pumpkin will be. The first one I made didn’t have enough candy in it, so it kind of looked a little droopy. Take the circles and the candies and center them over your hand. 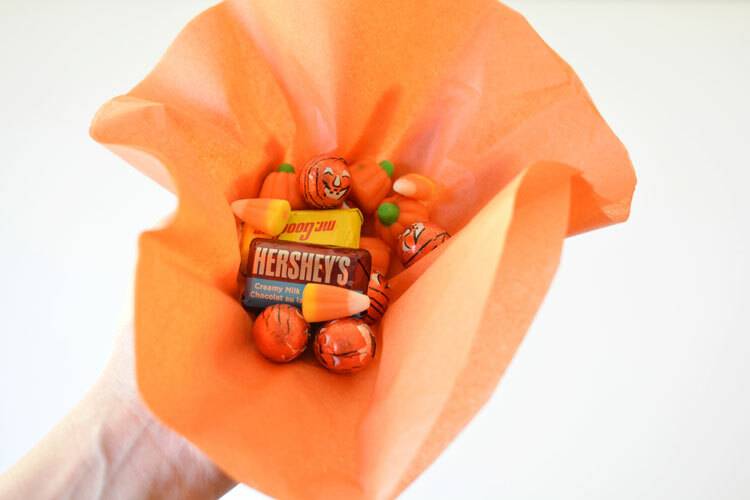 Use your fingers to gently bend the paper around the candy. 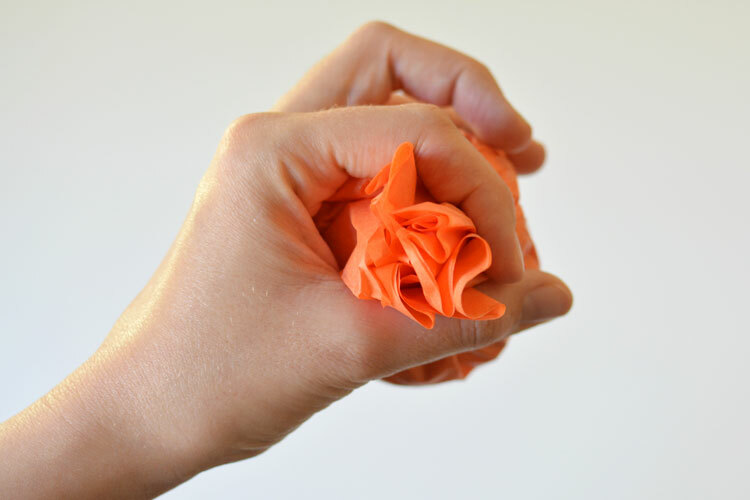 Try to get the folds as neat and tidy as possible. Gather up the edges of the circle. And then pinch and twist them closed as best you can. I thought it would be tricky to get the creases to look natural and tidy, but it really wasn’t too bad. Just do your best and I’m sure they’ll be great! 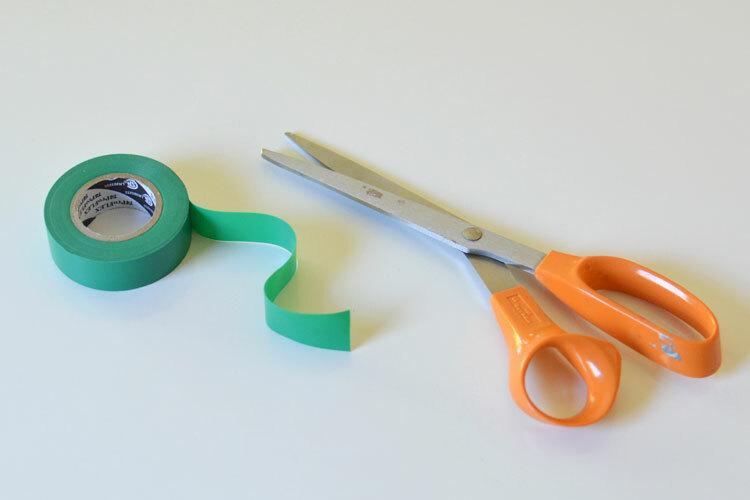 Cut a small piece of green tape. I used dollar store electrical tape, but you could also use floral tape or green painters tape. 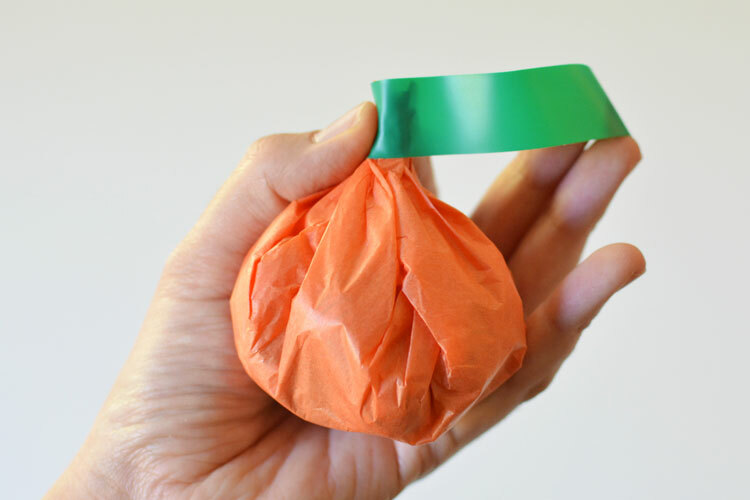 Wrap the tape around the twisted end of the pumpkin top. And twist it around to get the pumpkin stem. Don’t these make the cutest party favours!? 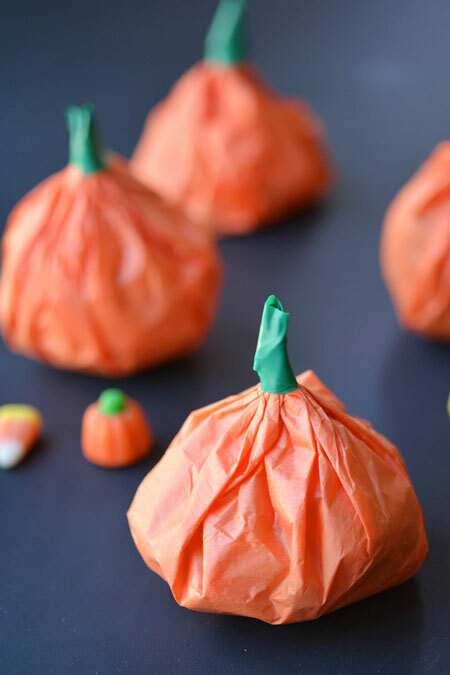 They are like miniature pumpkin pinatas! And when you open them up, they are filled with a wonderful surprise! Candy? Check! Presents? Check! I love the way they look for a Halloween party! Or even Thanksgiving? They aren’t spooky, so you could really use them for any autumn occasion. We went to the bulk store to choose a variety of different candies. I included candy corn, candy pumpkins, Halloween chocolate balls and assorted Hershey’s chocolates. Choose your favourites! 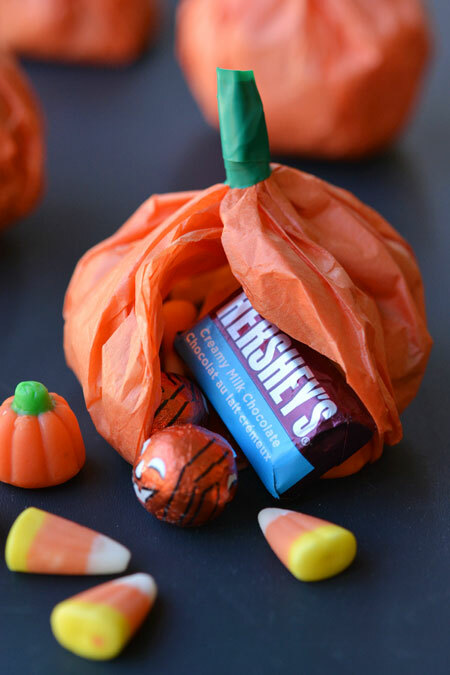 You can use mini chocolate bars, but make sure you include something else that’s small along with it (candy corn is perfect!) so that the little bundles have a round shape. 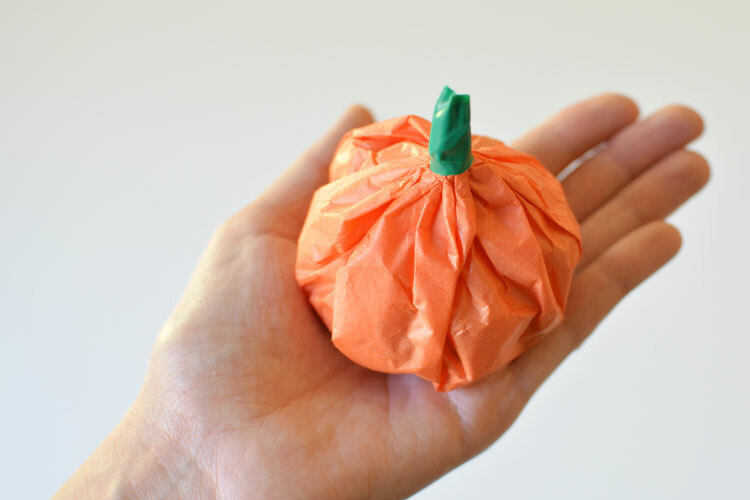 These tissue paper pumpkin favours are a fantastic treat to send to school on Halloween or they also make super cute party favours! 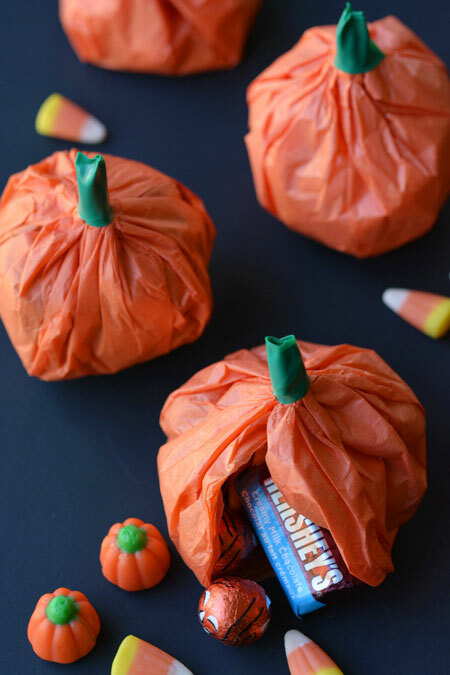 They are non-spooky, so you can use them for any occasion this fall. 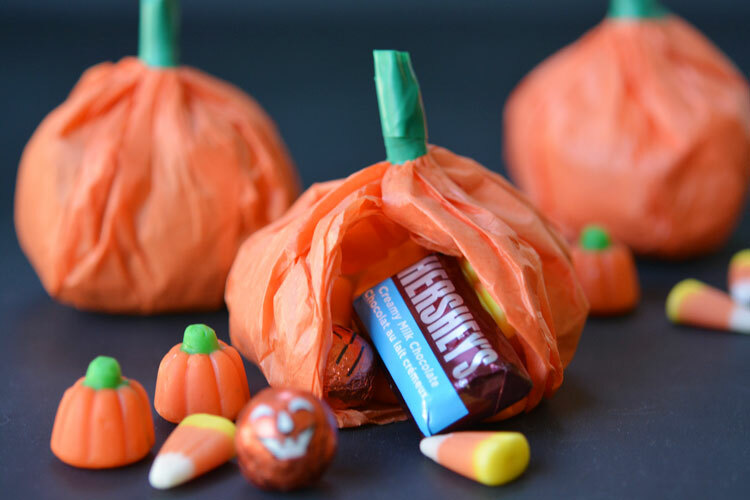 They take less than 5 minutes each to make (they’ll go even faster if you cut more tissue paper circles at once) and turn into adorable little pumpkin bundles! 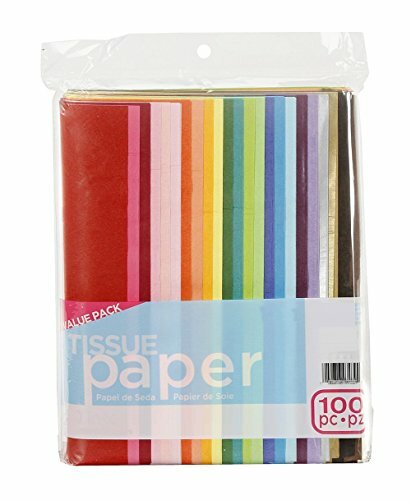 VALUE PACK - Always have tissue paper on hand for gift wrapping and more thanks to this 100-piece tissue paper value pack. It includes one hundred 20"x26" sheets of assorted colors. 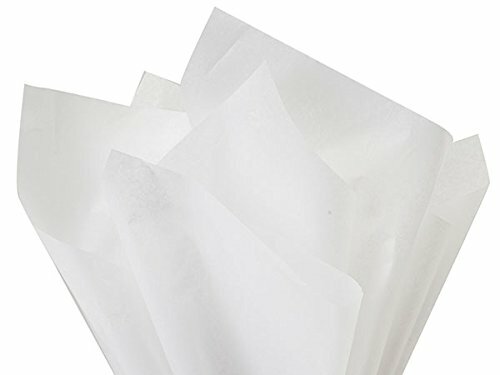 GIFT WRAPPING MUST-HAVE - Tissue paper is a must-have to keep in your home for all your gift wrapping needs - use it for gift bags or wrapping a variety of items. 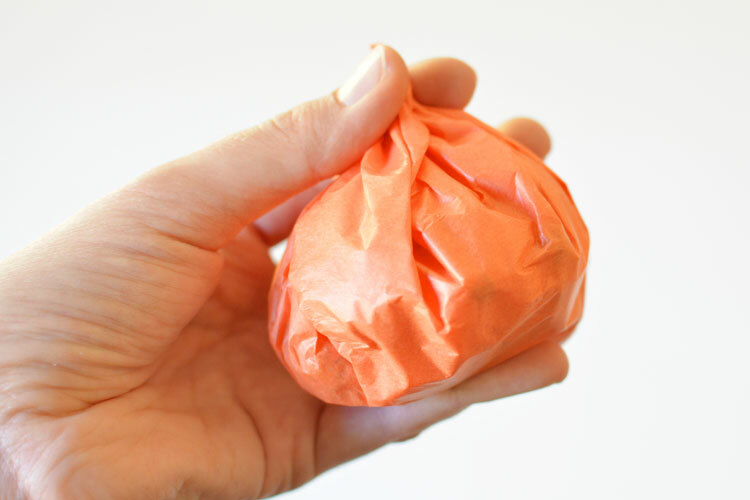 USE FOR CRAFTING - Tissue paper isn't just for gifts! Use it for a variety of craft, art and paper projects, including decoupage, party decorations and more. 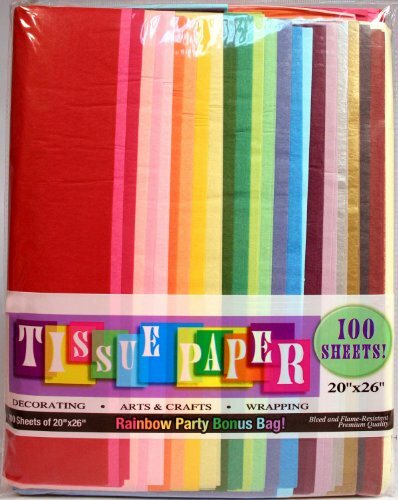 ASSORTED COLORS - With this value pack of tissue paper, you'll have a variety of solid colors perfect for any occasion. You'll always have the color you need! 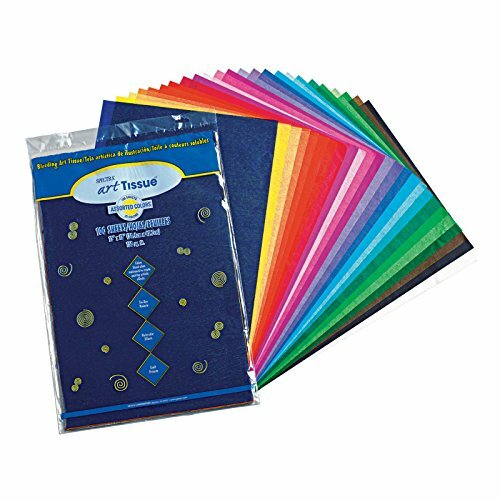 PREMIUM QUALITY - The tissue paper value pack features 100 sheets of multi-color, premium-quality tissue paper. 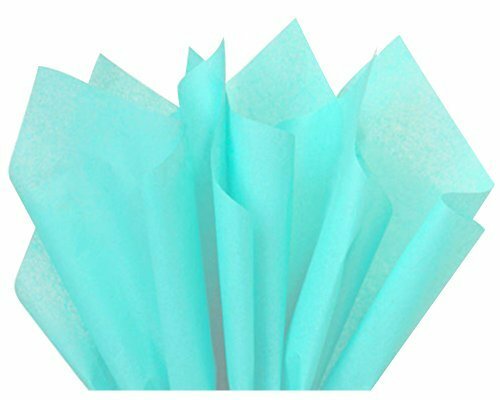 Creative Hobbies® Pack of 100 sheets of 20"x26" premium Quality Tissue Paper. 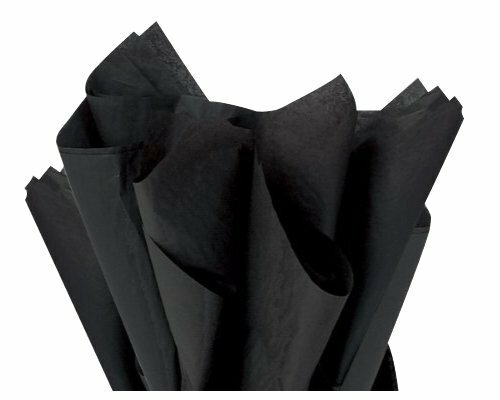 ShipGuard Premium commercial quality tissue paper. Great for all-occasion gift packaging! Perfect size for making 10-13" MEDIUM Pom Pom Flowers!